The headlines accompanying this back cover are only a few of the accomplishments of Graham Townsend, of Toronto, Ontario, who at sixteen years of age has produced a Master Album of Fiddling tunes, many of which are his own compositions. There is no question in the minds of the principals of Rodeo Records that Graham is headed for a very brilliant future in the field of music, and is a welcome addition to the outstanding Canadian fiddlers who already record for Rodeo Records. Much of the success of Graham has been due to the great encouragement given by his father and mother in assisting to develop the obvious talents of the boy, and Rodeo Records take this opportunity of wishing every success to this young Canadian talent. Graham Townsend was born in Toronto, Ontario, June 16, 1942 and raised in Buckingham, Que. He started to play old time music for dances, country fairs, garden parties and other engagements at the age of 9 and, at the same age entered and won CBC’s talent contest “Now’s Your Chance”. At 10 years of age he guested with Cliff McKay on Holiday Ranch and thereafter entered the Canadian National Exhibition Fiddle Championship, which he won 3 years in succession (1951, 1952, 1953). In the summer of 1953, when he was 11 years old, he entered the Canadian Open Championship at Shelburne, Ontario, and placed 3rd against 85 competitors and went on to win this competition in 1963 against 113 competitors. Graham’s accomplishments in the field of music are legendary from the many fine fiddle compositions which he has penned to the many competitions he has won. Graham has toured Germany, France and Italy to entertain Canadian and American Troops – has appeared on a number of occasions over WWVA, Wheeling, West Virginia, and has guested with Hank Snow, Carl Smith, Don Messer and many, many others. In January 1964, Graham was asked by a Hollywood producer to play on a new Country TV Show, which was built around the artist’s background. He accepted the 36 week contract and the show was filmed in North Hollywood, Calif. and Toronto, Ont. The show is called “Star Route” with narrator Rod Cameron, and is being shown around the world. Graham has made his home in the Ottawa Valley, where he is heard over Radio Station CFRA and CJOH-TV weekly. He makes many personal appearances in Ontario and Quebec wit his good friend and companion, Bob King. Graham Townsend was born in Toronto, Ontario, June 16, 1942 and raised in Buckingham, Quebec. He started to play the old time music for dances, country fairs, garden parties and other engagements at the age of 9 and, at the same age entered and won CBC’s talent contest “Now’s Your Chance”. At 10 years of age he guested with Cliff McKay on “Holiday Ranch” and thereafter entered the Canadian National Exhibition Fiddle Championship, which he won 3 years in succession (1951, 52, and 53). In the summer of 1953, when he was 11 years old, he entered the Canadian Open Fiddle Championship in Shelburne, Ontario and placed 3rd against 85 competitors and went on to win this competition in 1963 against 113 competitors. Graham has toured Germany, France and Italy to entertain Canadian and American troops - has appeared on a number of occasions over WWVA, Wheeling, West Virginia, and has guested with Hank Snow, Carl Smith, Don Messer and many, many others. In January 1964, Graham was asked by a Hollywood Producer to play on a new Country TV show, which was built around the artist’s background. He accepted the 36 week contract and the show was filmed in North Hollywood, California and Toronto, Ontario. The show is called “Star Route” with narrator Rod Cameron, and is being shown around the world. Graham has made his home in the Ottawa Valley, where he is heard over radio station CFRA and CJOH-TV weekly. He makes many personal appearances in Ontario and Quebec with his good friend and companion, Bob King. Graham Townsend strikes again with his 16th Long Play album of Canadian Fiddle tunes, as he salutes Don Messer, a dear friend and admirer, with selections that made Don famous. Graham was featured this summer with the Don Messer's Jubilee, as he toured our Canadian soil playing these very numbers you are about to hear. Big John McNeil plays a large part in Graham's own life, as this was the tune that helped sweep him to victory for the third time at the Shelburne Old tyme Fiddle Contest. I'm sure you'll enljoy listening once again to one of Canada's great Fiddle Champions - Graham Townsend - a master craftsman. The Rodeo/Banff Series represents artists who have been part of Canadian Country Music for thirty or more years. They are, in fact, part of our Canadian heritage. These recordings are the original performances and reflect Canadian recording techniques of past years. No attempt has been made to electronically enhance or embellish these selections, nor to create ‘pseudo-stereo’. Some of these recordings have been previously released on labels no longer on the market. I accept, with pleasure, this chance to say a few words about Graham Townsend through the release of this LP. He won his first radio contest when he was only nine years old and almost without exception, has been in the top honours for each contest ever since. This year he became the first person to win the Canadian Open Old Time Fiddling Championship for the fourth time! Last summer Graham accompanied the complete Don Messer Jubilee Show as it toured right to British Columbia and up to Whitehorse in the Yukon Territories. This tour lasted six weeks and Graham was able to meet many of the folk across the country who have admired his talents through the years. Eight of the twelve selections on this LP are compositions of Graham’s and I am sure you will enjoy these as much as his previous releases. Graham’s quiet, sincere personality has carried him far and coupled with his versatile musical talents, he is sure to contribute greatly in keeping the music of the Canadian people alive for many years to come. Through releases like this one, he will encourage others to follow this Canadian culture that means so much to countless thousands from coast to coast. Getting to know Graham Townsend both as a musician and as a person has been the greatest privilege of my life. As a musician, his countless talents know no boundaries, and as a person, his quiet, sincere personality make him one of the finest. Throughout his colorful career, he has touched on the lives of many people all across Canada, and with his down-home style of fiddling has won a special place in the hearts of these people. His many achievements in the fiddling world throughout his 20-odd years of playing are unequaled. He remains a four-time undefeated champion of the North American Fiddling Championships held in Shelburne each year, along with accomplishments much too numerous to mention. He is the composer of over 200 fiddle tunes, many of which have become standard favorites in the homes of people who have many or all of the over 20 albums that Graham has produced. On this album you will hear some of the oldest and most treasured tunes, such as Father O'Flynn, angus Campbell, etc. as well as one of Graham's own - Peter's Favourite', played in the traditional Canadian style - Old-time fiddling at its very best! As Graham's mother, I was very pleased and honoured when he asked me to do the liner notes on this, his latest release. There is a great variety of tunes on this album by some of our finest Canadian composers, namely, Johnny Durocher, Cec McEachern, Andy DeJarlis as well as four of Graham's own tunes. Wado Munro, the pianist with Don Messer on both radio and TV for so many years, and who Graham considers the finest in the field today, does the fine back-ground piano work on this recording. Support Canadian Old Time Fiddle Music. It is a rare record that can survey the full scope of traditional fiddling, yet on this album can be heard the lively and syncopated reels of French Canada, the intricate and involved melodies of Ireland, the lazy two steps from Cajun country, the aristocratic strains of the Cape Breton Scot and the driving hoedowns of Nashville. All are performed in expressive spirit by one of the world’s acknowledged virtuosos of the instrument: Graham Townsend. At the age of thirty-three, Graham has recorded more albums of traditional fiddle music than perhaps any other living performer and is undoubtedly the best known of Canada’s many skilled fiddlers. yet, strangely enough, this is his first record to be released outside his native country and perhaps it may make life a little easier for his many foreign admirers who previously have had to beg all friends and relations traveling to Canada to be certain to bring back the latest Graham Townsend record. His already devoted following will be pleasantly surprised by the record at hand, for it allows Graham to branch off into new areas, especially the difficult fields of Irish and Scottish traditional music - the music with which Graham was raised. (A forth-coming companion record will be exclusively devoted to this style). In addition, the inside cover of this album contains a full account by Sam Cormier of Graham’s life and the influences which have led him to become the master practitioner he is today. We are confident that this varied album will find a welcome home in the library of every fiddle enthusiast. At thirty-three, Graham Townsend is a certified phenomenon in the world of folk fiddling. Probably only the artist himself can see into his own inner world - the world of the soul - so in these notes I shall only attempt to describe the outer form of Graham’s career and the musical environment in which he was raised. Graham Townsend was born in the City of Toronto in 1942. His father was Fred Townsend who, at seventy-six, is still the master of a very colorful and difficult stepdance and is a truly remarkable square dance caller as well. Fred was born in Reading, England, near Berkshire, and migrated to Canada in 1908 at the age of eight. He grew up at Christie Lake, near Perth, Ontario, and was reared by a family of showpeople named Marks. Fred was a natural in this environment and became a master performer at country folk events where his calling of square sets became famous as masterpieces of elocution, rhythm and pantomime. Although Fred himself was not a fiddler, Graham received his basic training in meter and tempo from him. Graham began playing for local dances when he was ten and would follow the tempo established by his father. Fred was a very stern taskmaster and, like a true conductor, would pace of the dance. Graham’s mother is the former Enid Raine of Buckingham, Quebec. She is of Irish background and, to this day, is as devoted to music as the rest of her clan. I cannot recall a folk music event in the Ottawa Valley where Mrs Townsend has not been present and extremely attentive to the musical performance. Of all Graham’s followers, I have the distinct conviction that she must be the most enthusiastic as well as the most constructively critical. But, after all, who can take more liberties with an artist than the one who knows his strengths and weaknesses most intimately? Until Graham was nine, the Townsends lived at Buckingham, Quebec, which lies in the midst of the Ottawa River Valley. During this most critical stage of one’s personality development, Graham found himself immersed in the continual round of musical events graced by friends and neighbours of his immediate clan. His grand-uncle Eddie Dunning was a fiddler who could derive a particularly fine tone from the violin and his wife Elizabeth always welcomed young Graham into their house with the same warmth as he would have received at home. Another uncle, Sam Raine from Grenville, Quebec, Graham was able to see less often but nevertheless constituted an important influence on his development. Graham’s cousin, Gerald Houston in Paltimore, would take him to listen to Billy and Lornie Smith, local fiddlers who specialized in Irish and Scottish numbers. From Dan LaSalle of Buckingham, Graham heard other French Canadian and Irish compositions that went outside of the restricted field of Canadian country tunes. It is interesting to note that, although Don Messer, through the radio and his many recordings, was the folk fiddling idol of the masses across Canada, he was not the popular hero in the group in which Graham lived and played. Indeed, the early records Graham remembers best from his boyhood were those by (Joseph) Allard, Bouchard, Beaulieu and (Isadore) Soucy from Quebec, (Michael) Coleman, Morrison and Cronin from Ireland and Scott Skinner from Scotland. 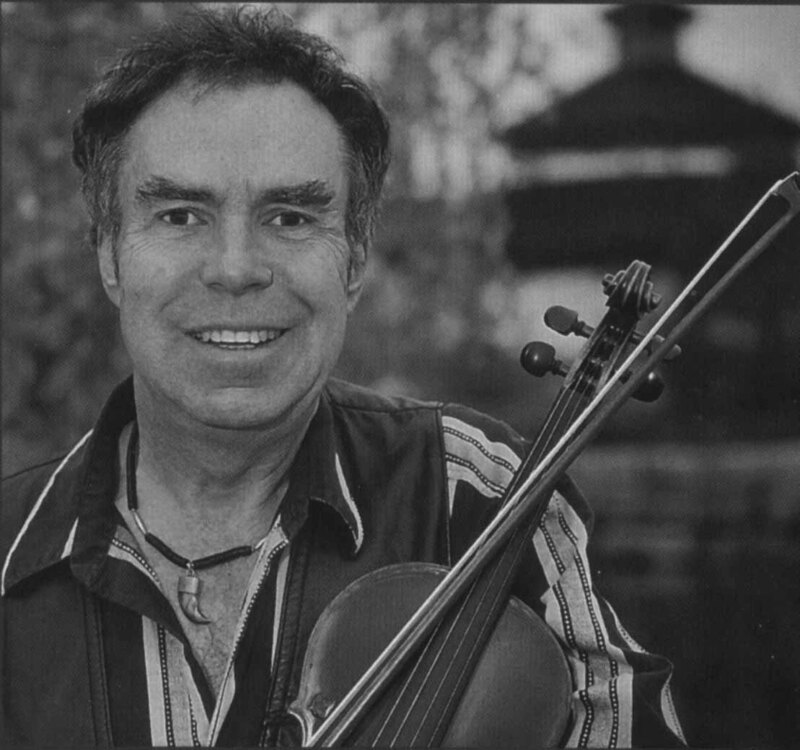 Although Graham performed often with Don Messer and recorded many of his tunes, his early exposure to a wider variety of folk fiddling styles and talents brought him to the realization that fiddling as a musical form runs a long range from the simple and ordinary to a level of complexity that requires the talent of an artist and skill of a technician. From those early years sprang the constant obsession with mastery and perfection that explains why Graham is still often discontented with his performances, long after most of his admirers have concluded that he has mastered the art. Graham began playing at the age of eight on a toy violin, received as a gift from his parents. He practiced on it for a year, using only two strings. When he was nine, the family returned to Toronto and he was placed under the tutelage of Tom McQuestion, a well-known Irish fiddler. McQuestion provided young Townsend with a three-quarter sized fiddle and instructed him in the basics of the art. Graham remembers that at their first teaching session, McQuestion taught him three tunes: Bonnie Kate, High Level Hornpipe and an unnamed Scottish jig. McQuestion and Graham’s father were close friends and Fred would call sets at Tom’s dances. It was through McQuestion that Graham met the man who was to be the central influence in his musical career: Billy Crawford. Graham’s long association with Crawford could only be described as a love affair. Apart from a deep personal friendship, he received from Crawford an exposure to truly great fiddling, the most assiduous and dedicated teaching that a young student could desire and a high standard of musical consistency and self-discipline. Billy Crawford was a rugged individual. He was a bachelor who knew who he was and what he wanted out of life. He had no patience with mediocrity or half-commitment. It was always all or nothing with him. For that reason, it would have driven him crazy to have taught music on a commercial, come-one, come all basis. Graham’s lessons were scheduled every Tuesday and Thursday evening at eight o’clock; on the rare occasions when Graham arrived at 8:05, the blinds would be drawn and the lesson would be canceled. Graham remembers these occasions with nostalgic affection, realizing that Crawford insisted upon strict self-discipline for his own good. Crawford, like Tom McQuestion, had been born in County Antrim, Ireland and was a great fiddler who had won the Lady Antrim Trophy several times before he migrated to Canada. He possessed a beautiful tone and played slowly but with exquisite timing. He had bull control of the length of the bow and utilized all the power inherent in it. He was, naturally, very versatile, the master of slow airs and breakdowns, and always maintained a properly offensive stance in his treatment of tunes. After a year, Crawford graduated Townsend to the full-sized violin. Billy had returned from the war in Europe with three trunks full of instruments and he sold Graham a genuine Maggini for $125. This is the violin which Graham recently appraised at a value of $6,200. Hundreds of tunes were learned from this great fiddler and teacher. Graham’s particular favorites were John McCormick’s Hornpipe, Picnic Reel, Don The Cobbler, and two tunes which appear on this album: Miss Monahan and Roxborough Castle. Graham was nine years old when he first played at a public function in Buckingham. It was a house wedding and the collection yielded a grand total of $6.25. Although Graham was to live in Toronto henceforth, Buckingham remained his spiritual home for years. Five or six times each year he would return to the area as well as spending most of his summer vacations there. By the age of twelve he was considered to be the fiddling prodigy in the valley. He played at garden parties, strawberry socials, house weddings and parish picnics. Graham remembers with particular fondness the annual picnics in the parish of Mayo and its priest, Father Braceland, a good fiddler who staged these fundraising events out of sheer dedication to folk music. Each picnic featured a concert in the afternoon and a dance at night. In 1951, at the age of nine, Graham entered a fiddling contest at the Canadian National Exhibition in Toronto. Graham entered the thirty years and under class and proceeded to win it for three consecutive years. At the same time he won a talent show sponsored by the CBC entitled “Now Is Your Chance” and then performed with the Holiday gang on their Easter week program and for eight additional weeks on their talent show. Naturally enough, while all this was going on, Graham was also performing at a variety of concerts and dances. In 1953, he entered the North American Fiddling contest at Shelburne, Ontario. He was entered in the open class and came in third, at the astounding age of eleven. The first prize that year was won by the late Ward Allen, already a legend to the people of the Ottawa Valley. To see Graham perform in competition is truly an awesome experience. It sometimes appears that, as if guided by a sixth sense, he performs only as well as he needs to. Usually he will play only well enough in the playdowns to make the top ten and the semi-finals. There he picks up the pace sufficiently to become a finalist, but only at this last stage will he switch from defensive to offensive fiddling to emerge with unbelievable performances that leave his rivals in no doubt as to the victor. Fortunately for these other fiddlers, although Graham now frequently appears as the special invited guest at numerous fiddling contests, he rarely enters. In 1963, he won the great contest at Shelburne. This competition is considered to be the most rigorous in the world and to become its open class champion at the age of twenty is no mean feat. In 1968, Graham entered again and proceeded to win first prize for the next three years, after which he retired as its undefeated champion. By the time our star had grown to fourteen, however, certain difficulties began to materialize at school. As Graham terms it, “The school teacher and I both rebelled.” The teacher became convinced that the fiddling activity was ruining Graham’s scholastic destiny whereas Graham was equally convinced that such scholastic requirements were hindering the one and only career he was interested in: playing the violin. So for another two years, it was will against will until Graham turned sixteen, threw caution to the winds, quit school and decided to concentrate on his primary interest and love, a decision he has never regretted. Graham was then hired by the CBC to participate in a series of radio broadcasts called “Country Cavalcade”. In doing this, he had a tour of the Maritimes where he made many friends whom he cherishes to this day. On this tour he was approached by Rodeo Records to do some recordings. His first LP included a number of his own compositions but Graham was not happy with the results because he had not received the scope and quality of accompaniment which he had expected. And yet, to his surprise, the record sold very well. After Graham’s 1963 victory at Shelburne, he was hired by the CBC and the Canadian Armed Forces to tour Germany, France and Italy in order to entertain the Canadian and American troops. He considers this tour to have been a very crucial event in his career, for it gave him added confidence as a performer and, in addition, allowed him to meet many people, including Stephan Grapelli, the great French jazz violinist who introduced Graham to the world of jazz and blues. In 1964, he moved to Ottawa, Canada’s capital city, where he was hired by CFRA Radio for a regular program. This station was owned by the late Frank Ryan, an outstanding leader in the life of Ottawa and a true Irishman and fiddle lover always. For Graham, this program represented a return to the part of the world he loved most and he soon had a show on CJOH-TV and a daily radio program. 1967 was Canada’s Centennial Year and it provided Graham with a chance to become better acquainted with the famous step-dancers Don Gilchrist and Gilles Roy. They performed together with Phillippe Bruneau, the great French Canadian accordionist, at Expo ‘67 and played for Queen Elizabeth on Ottawa’s Parliament Hill on July 1. The warm experiences of that Centennial year made Graham feel very proud to be a Canadian. Graham becomes instantly enthusiastic when he speaks of Don Gilchrist. To Graham this man, born and brought up in Campbell’s Bay in the Pontiac County region of western Quebec, is no less than a living legend in the field of folk step-dancing. Brought up in an Irish area that lived almost exclusively for music and dancing, Don began dancing almost a soon as he could walk. Borrowing from the French Canadian, Irish and Scottish styles of dancing, he blended these into a truly new Canadian art form which is as complex and beautiful as anything else in its class in the world. In addition to his person dancing artistry, Gilchrist is a highly gifted teacher and his most famous product, Gilles Roy, is also one of Graham’s life-long friends. Gilles was a French Canadian boy from Cumberland, near Ottawa, and his dancing wizardry has made him, like his master, known and loved across Canada. Graham has performed with Gilles intensively around the Ottawa Valley and in 1967 they traveled together on the Grandpa Jones show and on a goodwill tour of the Arctic with Canadian Secretary of State Judy LaMarsh. The next year Graham moved back to Toronto and has continued his guest appearances on TV, radio and at the many fiddle events held throughout the country. His wife Eleanor is becoming well known in her own right as a fiddler. She has made several records and was second in the open class at Shelburne in 1975. She is improving rapidly and is much better than she will allow. She will reach her peak when she can pass from defensive to offensive fiddling and is certain to be known for a long time as one of Canada’s top performers. The Townsends have a year old song and, given his heredity and environment, it is interesting to ponder his likely musical future. Graham has now recorded twenty-four other LPs for various labels, a truly astonishing total for a musician of his age and a great tribute to his tremendous popularity at home. yet, for Graham, the present record represents something special. In all his previous recordings he was unhappy in that he had to play to the market rather than to the echoes of his own musical soul. The tunes he played were common everyday tunes which were bound to be familiar to the countless purchasers. But the did not satisfy his own inner taste. In this album he strikes out into medleys of tunes and plays his own kind of music rather than what he feels the crowd is expecting. This is an important production for him as it is a test of his own conviction that the folk-music lovers of North America will respond to greater variety if they are exposed to it in a well-produced manner. In a word, this album could well mark the end of his records as one-tune successions and the beginning of a new venture in more medley arrangements and the introduction of new, less known airs, including his own compositions. It is not sufficiently appreciated that Graham, along with of Nova Scotia, is one of the most prolific violin folk music composers in Canada today. His compositions number over two hundred and fifty and six of these can be heard on this album. The beautiful tune, Dungannon Sweetheart, by the way, was composed in honour of Eleanor Townsend, who is originally from Dungannon, Ontario. Like all true artists, Graham enjoys his work intensely, particularly when the setting is right. He confesses to sometimes having to struggle through a night club assignment where the clients limit him, by their requests, to only an odd dozen elementary country tunes. In such a setting, a three hour evening can seem like a very long time. But in an environment like the Mariposa Festival, where he was a workshop consultant last summer, he can fiddle forever. He still loves to reminisce about how he and Winston Fitzgerald retired under some shade trees and fiddled to one another non-stop for four hours. Graham is always a superb performer in the technical sense but it is when the audience is with him that the soul of the artist comes out. It is not the size of the crowd that has its effect on his performance, but their responses and communication. I have seen him perform at his technical best for an audience of one thousand one evening and he was truly tremendous. But the next day the soul of the real Graham Townsend came out at a small picnic in Quebec. There, he was surrounded by characters like his father, Don Gilchrist, Gilles Roy and a small local crowd who worshipped his talents. Every year on the March Sunday nearest St Patrick’s Day, the entire fiddle-loving population of the Ottawa Valley converges on Quyon, Quebec where Lennox Gavin has gathered an impressive group of fiddlers, dancers and Irish singers. the entertainment officially begins in the large bar at two p.m. but the crowd is already there because those who don’t come early are destined to be out of luck. The party invariably goes on until way past midnight and is a credit to Graham’s devotion to folk music that he can keep going through such a marathon in the highest possible spirits. In 1971, I attended the Shelburne contest for the first time. This huge event had started in 1951 on a very elementary scale but has since exploded into a famous international fiddling attraction. Shelburne is a small rural town north-west of Toronto with a normal population of two thousand people, but on the second weekend of August, the population enlarges by a factor of five. The town park is overtaken by an army of tent-trailers and, after the regular contest events each evening, most of the crowd returns to the park where clusters of people stand about listening to fiddlers and watching step-dancers do their stuff on make-shift six by six plywood stages. For three days and nights, fiddling and dancing continue without a pause in some part of Shelburne. Graham Townsend was there at the same time as I, appearing as a special guest fiddler. That evening the late Johnny Mooring had arranged to have a truck with sound equipment brought into the park. Flanked by bonfires, the back of the truck provided an ideal platform for an unending procession of fiddlers and dancers to show their wares. But around four in the morning, several of us were chatting with Graham on the opposite of the park and it suddenly seemed as if the fiddlers had given up, the bonfires had died out and the back of the truck was bare. “This will never do,” Graham announced. “Let’s go over and raise hell!” He was really in the mood that night. He played until seven that morning with scarcely a pause and I’m certain he never repeated a tune. As I limped off towards bed to get a wink of sleep before returning home, I realized that I had been in the company of one of the world’s truly great fiddlers. Five years later, in these notes, I have endeavored to pay some tribute to the wonderful musician I heard that early morning in Shelburne. Produced by Mark Wilson and Graham Townsend; Engineered by John Nagy, Boston, Massachusetts, April 1976. In the nineteenth century, an international fraternity of fiddlers flourished whose membership generously stretched across Britain and North America. The popular stage gave these musicians employment and mobility; musical publishing houses provided their means of communication. Looking over the tune collections of the period – Ryan’s Mammoth Collection (known today as Cole’s Thousand Fiddle Tunes), the various Kerr anthologies, Oliver Ditson’s many publications – one is struck by the astonishing range of material presented, one where Irish jigs nestle with Scots strathspeys, diverse types of country dance music, minstrel clogs and sand jigs, popular selections from operatic works, an so on. Literate fiddlers of the period could commonly provide selections from this entire musical spectrum. After the turn of the century, these cosmopolitan linkages weakened considerably. The rise of vaudeville and Tin Pan Alley pushed the fiddler out of the music hall and ballroom into the barn, schoolhouse and backporch. However, in Eastern Canada and the major cities of the northeastern United States, the conglomerative spirit of the nineteenth century lived on. Graham Townsend is a particularly skilled and well-known product of this environment. As he grew up, phonograph recordings had functionally displaced the older tune books (Graham does not read music), and a splendid range of talented violinists could be heard in the environs of Toronto alone, then enjoying a phenomenal period of growth that had converted it into a melting pot for the entire United Kingdom. On this album, Graham pays tribute to the classic fiddle repertoire that has always been his first love in music. Graham’s accompanist here is young Glenn Paul, a Lanark, Ontario native currently studying jazz piano in Boston. Glenn does an excellent job n providing the difficult changes this music requires. For more information on Graham, see Rounded 7002 which features more fiddle music in a wide variety of styles. Bob’s Double Clog / Jackie Coleman’s / Ballinaslow Fair: Graham learned the first clog from the well-known Montreal fiddler Jean Carignan who, despite his firm Quebecois background, is well-known as a devotee of Scottish and Irish music. Jean has recorded this piece himself for Folkways. Jackie Coleman’s came from a disc by the late Paddy Killoran of Sligo and New York and Balinaslow Fair was learned many years ago from a 78 by the Irish master Michael Coleman. Plymouth Lasses / Maggie Browne’s Fancy / Buttermilk Mary: Graham acquired the first two jigs from Tommy McQueston and Billy Crawford respectively, both Irish émigrés in Toronto who played a large role in Graham’s musical education (cf, notes to rounder 7002 for details). The second tune is listed by O’Neill as Planxty Brown and credited to O’Carolan. The third number of this set of familiar Irish jigs was acquired from Sean McGuire during one of his visits to Canada. Stacks of Barley / The Galway / The Golden Eagle: The first two hornpipes were popularized on a recording by Michael Coleman; the third was learned from Billy Crawford. Trouble Among The Yearlings: Although Hell Among The Yearlings is originally an Appalachian melody (the Kessinger Brothers made an influential early recording), Graham learned his unusual version from the Irish violinist Billy Crawford. Partie de lancier / Marche Carolino: The pioneer recording artist Joseph Bouchard was Graham’s source for the first selection. In his seventies, Joe is still fiddling actively in Quebec. Marche Carolino comes from Oscar Morin, a Montreal harmonica player. Indian Reel: Learned from a 78 by the late Joseph Allard, one of French Canada’s premier violinists. Bonnie Kate / Pigeon on the Pier: Although the first reel is actually Scottish in origin, Graham has based his arrangement upon the distinctive Irish casting of the tune due to Michael Coleman. The second piece, often titled Pigeon on the Gatepost, was acquired from Bill, Laury and Francis Cormier, a trio of brothers who all played for George Wade’s Cornhuskers, an extremely popular Canadian dance ensemble of the thirties and forties. Bill and Francis are deceased but Laury still lives in Toronto. Le Two-step d’Armand: Although Graham is a prolific and talented composer, this is the only Townsend original to appear here. He had just put the finishing touches on this fine composition immediately prior to the recording session and named it in honor of the father of his frequent touring partner, the stepdancer Gilles Roy. Reel Point-Au-Pic: One of the classics of the French-Canadian repertory, Joe Bouchard (Graham’s source) and Isidore Soucy both made famous recordings of this on 78. Crowley’s Reels / Teetotaller’s: The first brace of tunes comes from one of Michael Coleman’s 78’s; the last tune is a version of the widespread Temperance Reel which Graham learned from Billy Crawford. Eugene Stratton / The Arthur Seat / Banks: The Scottish composer J. Scott Skinner first recorded this difficult medley of tunes in 1910 and the set has served as a showpiece for the fiddle technician ever since. The two tunes in B flat, named for a blackfaced singer and a geographical locale respectively, were both composed by Skinner himself, whereas the third (in E Flat) is credited by Skinner to Parazotti. This latter tune is also known as Mrs. Taft. Skinner’s original can be heard on Topic 12T280 and provides a marked contrast to Michael Coleman’s “Irish” treatment on Decca or Joe Cormier’s “Cape Breton” version on Rounder. Graham has added the pizzicato passages to the present version. Rakes of Kildare / Dan The Cobbler / Geese In The Bog: These familiar Irish jigs take Graham back a long way. The first he learned from the late Dan LaSalle in his hometown of Buckingham, Quebec. The second two came from Billy Crawford and Tommy McQueston. Lucy Campbell / Walker Street: Learned from Michael Coleman and Billy Crawford respectively. The Iron Man / Jamie Hardie: Although these tunes were both composed by Scott Skinner, Graham’s treatment here is definitely Cape Breton in flavor. (Skinner’s originals, now available on Topic Records, make for an interesting comparison.) The strathspey was learned from the inimitable Winston “Scotty” Fitzgerald and the reel from the late Mike Campbell, one of many Cape Bretoners then exiled in Toronto. Reel de mon grandpere / La Belle Catherinette: The first comes from the Winnipeg fiddler Andy DeJarlis, one of the best known of Canada’s “Western” fiddlers; the second is due to Joe Bouchard. Judique Jig Medley: Most Cape Bretoners never know the names of the tunes they play and even Graham Townsend, with his fantastic memory for such matters, has never discovered the correct titles for these Scottish jigs. The middle the was acquired from Angus Chisholm; the rest comes from a Celtic 78 by Winston Fitzgerald and his Radio Entertainers. The Title, “Canada’s King of the Fiddle”, bestowed on Graham Townsend was not some marketing agency’s promotional phrase to hype his fantastic talents. No. Graham Townsend earned it! Having won the North American Fiddle Championships for five years, performed at not one, but two command performances for Her Majesty, Queen Elizabeth II, composer of over 300 fiddle tunes and recorded on 28 albums. Graham Townsend is the undefeated “King of the Fiddle”. A Graham Townsend performance is always a musical masterpiece represented by a showman who has the instinctive ability to give the audience what they crave for and then some! Such is, the Graham Townsend both you and I, as his business manager, know so very well. Besides the public person, Graham, like all showpersons, has a private life. He and his wife, Eleanor, enjoy their home, their friends and of course a good party. In this recording you are blessed with an actual taping of a real live ‘house party’ (no studio, no canned sound effects). You are going to hear Graham play without the pressures of public performance and yet with the perfection for what he is renowned. Here is Graham Townsend, playing for a genuine ‘House Party’ - Put it on and let the party begin! I am very proud and happy to have my son taking part on this album, playing drums and spoons. It's been a little while since Graham brought out his last LP and I for one said "it's about time". Perhaps he doesn't know it, but I have every one of his releases since he began his illustrious recording career. Judging from the size of my collection, one would expect an author and artist of more mature years - but here we have a young musician in the prime of his life. We sincerely trust that you'll enjoy this new album. Three of the selections - Maytime Swing, Debbie's Waltz and Willow Tree Hornpipe are his own original compositions. Keilly's Reel and Larry O'Gaffe, each traditional numbers, are included too for your listening pleasure. All in all he now has 250 compositions to his credit and over 200 have been already recorded. Graham Townsend is a Canadian legend in the music world. His accomplishments have placed him in the domain of 'World Class'. He is a five-time undefeated North American Fiddle Champion; star of CBC TV, radio, and recordings. Graham appeared in the highly acclaimed film Beautiful Dreamers with Rip Torn, and has done two royal command performances for H.M. Queen Elizabeth II: 1967 in Canada, and 1982 in Australia. He has performed in 12 different countries, and shared the stage with such luminaries as Hank Snow, Wilf Carter, Tommy Hunter, Hagood Hardy, kd lang, Sylvia Tyson, Stompin' Tom, Allan Thicke, Gordie Tapp, Dinah Christie, Don Messer, Raffi, Porter Wagoner, Buck Owens, Johnny Cash, Bill Munroe, Stonewall Jackson, Sonny James, and many others. Graham's prolific recording career includes 40 albums to date, with over 350 original fiddle tunes self composed. 'The Man With The Magic Bow' is an inductee into the North American Fiddlers Hall of Fame, and the Country Music Hall of Fame, Ottawa, Canada. He has adjudicated and appeared as a guest several times at the Grand Masters Fiddle Competition in Nashville, Tennessee, as well as playing The Grand Ole Oprey. At the time of writing, Graham is celebrating his 40th year as a musician by embarking on a Canadian Tour with Katherine MacKinnon and John Allen Cameron dedicated to and our war veterans celebrating 50 years since the end of World War II. With this resume, it is no wonder they call him The Master Of It All. No other fiddler has achieved the accomplishments of Graham Townsend. A living legend, he is a five time undefeated North American Fiddle Champion, star of CBC TV, radio, stage and recordings. He appeared in the highly acclaimed film 'Beautiful Dreamers' with Rip Torn. He has given two command performances for HM Queen Elizabeth and HRH Prince Philip. Graham has travelled the world performing with such notables as Hank Snow, Wilf Carter, Tommy Hunter, Haygood Hardy, kd lang, Sylvia Tyson, Stompin' Tom Connors, Allan Thicke, John Allan Cameron, Gordie Tapp, Dinah Christie, Don Messer, Raffi, Sharon Lois and Bram, Porter Wagoner, Jimmy Dickens, Kitty Wells, Roy Acuff, Dolly Parton, George Jones, Sonny James, Buck Owens, Bill Monroe and the list goes on. He has recorded 41 albums to date, is an inductee to the North American Fiddlers Hall of Fame and the Country Music Hall of Fame in Ottawa, Canada. He has adjudicated and appeared as a guest several times at the Grand Masters Fiddle Competition in Nashville, Tennessee and has appeared on the Grand Ole Oprey. He is the composer of over 350 fiddle tunes, and has influenced virtually every young fiddler in Canada. Country Licks And All That Jazz was recorded for the CBC in 1982 but it was never released commercially. Margaree Sound is proud of its association with Graham Townsend and we hope that you enjoy listening to this recording as much as we have enjoyed bringing it to you.